Nearly 200 teachers, students and supporters took to the streets of Ketchum and Hailey on Wednesday to protest pending legislation that could devastate funding for education in Blaine County. About 65 protesters showed up at the corner of Main Street and Sun Valley Road in Ketchum. Hailey police put the number at 125 on north Main Street in Hailey. Dubbed the "human chain across main" rally, protesters in both cities kept to the sidewalks and did not impede traffic. Tryntje Van Slyke, a teacher at Wood River Middle School and president of the Blaine County Education Association, said she was pleased with the turnout. "We had a lot of people honking—honk for education," Van Slyke said. "We had good support, and Dr. Barber came too and some of our board members." Van Slyke was referring to Superintendent Lonnie Barber and the Blaine County School District board of trustees. The rally was the third protest within the past few weeks in Blaine County regarding pending legislation and was held in conjunction with rallies across the state coordinated by the Idaho Education Association. 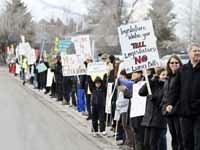 The protests are against education reforms proposed by state schools Superintendent Tom Luna. Legislation is currently pending that would reduce the negotiating powers of teachers unions, base teachers' pay on performance rather than tenure and replace several hundred teachers in Idaho with laptop computers and online coursework. Particular to Blaine County and three other school districts in Idaho is another piece of legislation that would eliminate permanent tax levies that fund teachers' salaries and operations in the districts. In Blaine County, the levy provides nearly $30 million annually for education. In Ketchum, protesters manned all four corners of the intersection of Main Street and Sun Valley Road holding signs with slogans such as "Please protect my education," "Follow the money out of state" and "If you can read this ... thank a teacher." Hemingway Elementary School teacher Sandy Scott held a sign saying: "I'm a teacher, I give these bills an F."
"They're wrong for teachers, they're wrong for education, they're wrong for the state of Idaho," she said. "There are four different bills and they all have their problems." Referring to legislation that would limit the bargaining power of teachers' unions, Scott said: "It rips the heart out of the teacher organizations. That bill destroys the bargaining rights of the teachers' union." Scott was also critical of legislation that would fund technology to replace teachers. "I'm looking at my leaders in government to be creating jobs," she said. "This bill would cut jobs. It's a domino effect; when teachers aren't out buying things, it affects the whole economy. "I've been a teacher a long time—33 years—and I don't think I've ever felt as disrespected or bullied. It's hard not to take it personal." Cathy Butterfield said she attended the rally because of her mother. "I'm a librarian and I'm not supposed to take sides, but I'm here for my mother—she was a teacher—who's worried about her pension being taken over by the state," Butterfield said. "With the IEA [Idaho Education Association] it's been very stable and not subject to the radical market. The state's already talking about converting everything into IRAs." Hannah Young, a teacher at the private Community School in Sun Valley, said she came to the rally to support her colleagues in the public sector. "I feel like all teachers need to stand together and I feel that the passion of the teachers needs to be taken into consideration," Young said. "I just don't feel like we're being considered." Annie Kaiser, president of the Hemingway PTA, said she hopes the rally will promote awareness. "I'm getting comments from a lot of teachers that are really nervous," Kaiser said. Jean Estep brought her children, twins Caroline and Christine Estep, both second-graders at Hemingway. Caroline said she was there to "help our schools." Christine said: "I'm part of dual immersion [two-language program] and I want to travel the world when I grow up and I don't want that to go away." "I want excellence for our children," said Jean Estep. "Satisfactory is not good enough. I was out of town and when someone told me they were buying laptops to replace teachers, I thought it was a joke. And then I find out they're really considering it. "We're asking parents to turn their TVs off, and now they're asking for online teaching? The problem with technology is that it takes away our humanity."